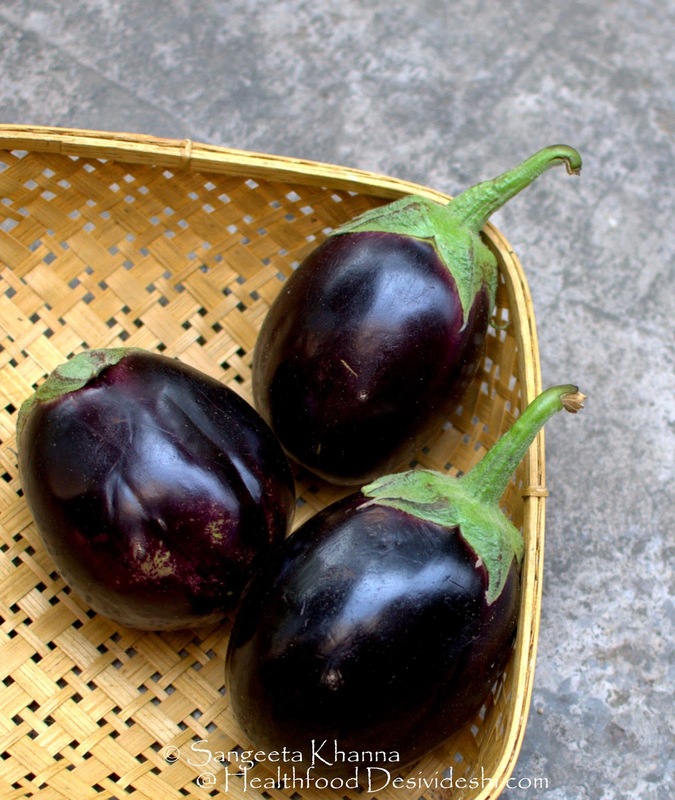 Eggplants are versatile vegetables found in various shapes and hues. I have grown almost all possible colours and shapes of eggplants in my gardens over the years and have found slight variations in taste and aroma etc, and the way they cook to become too soft or a little firm. Some of them have a little bitterness after cooking and some have a subtle sweetness that they impart to the baingan bharta or baba ghanoush we make with them. I am now realizing that I haven't yet shared our traditional recipe of baingan ka chokha (eggplant mash), not even the baingan ka bharta, both being similar in looks but very different in flavours. I will correct this mistake really soon and share both the recipes. 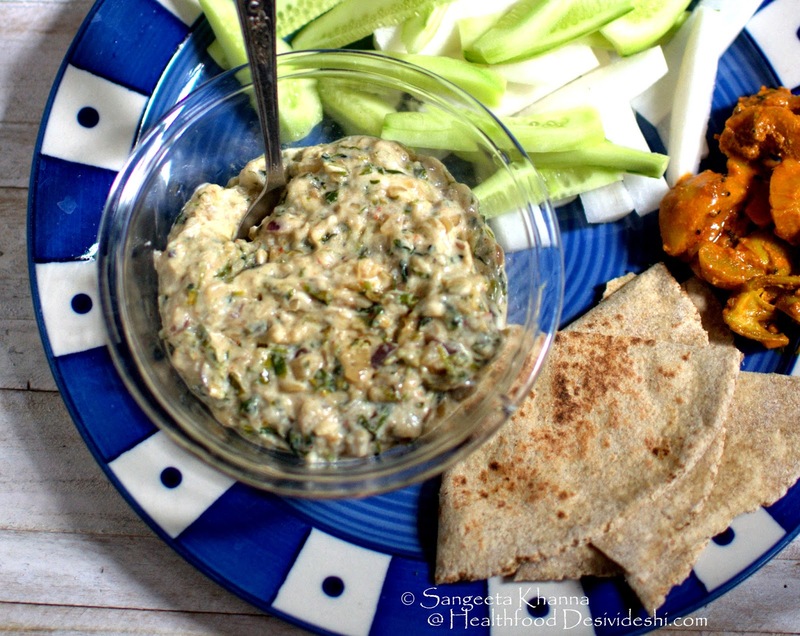 This eggplant raita or baingan ka raita recipe was long overdue since Amrita asked for it once I shared a picture of this raita with a beetroot salad recipe. Now that this raita is quite frequent on my plate owing to the ease to cook it and the way I can make variations too, I took a few more pictures and now the recipe is here. 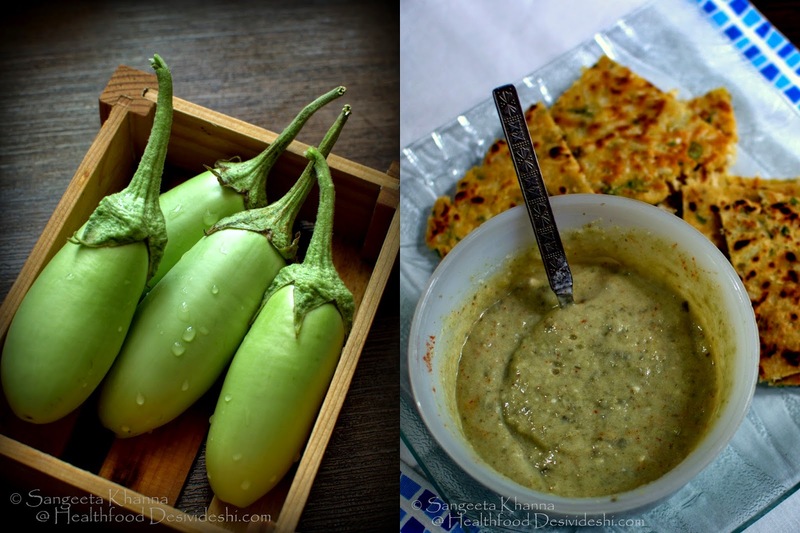 I am sharing two variations of eggplant raita. 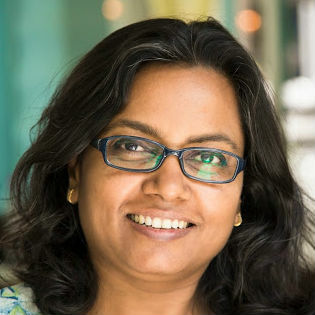 One with the green eggplants from my garden and another with the round purple variety that is also called bharta wala baingan here in north India. These green oblong beauties are fresh from my garden and I sometimes just grill them on gas flame for a couple of minutes as they cook really fast. I never bother to peel these ones after grilling as the skin is very thin and doesn't change the taste of whatever I cook with them. I make a smooth blended raita with these which is mostly had like a thick cold soup. Here I served it with a raw papaya paratha (with besan and atta mix) and polished off a huge bowl of this raita with just one paratha. This recipe is useful when you want to consume loads of vegetables and some calcium supplementation in your food too. I have added sesame seeds to this raita along with hung yogurt to fortify it with calcium. Powder the sesame seeds first in food processor of blender. Add hung yogurt, mashed eggplants and other ingredients together and blend till smooth. Serve as desired. You can use fresh yogurt if you like this raita a little liquid but note that the grilled eggplant mash is quite watery too. The round purple variety of eggplants is more fleshy and more aromatic I feel. I have not grown this variety for years now but I keep buying it whenever I see some fresh light weight eggplants of this variety. Always choose shiny, light weight eggplants with a fresh green crown on them. These need to be flame grilled too to made into a raita. 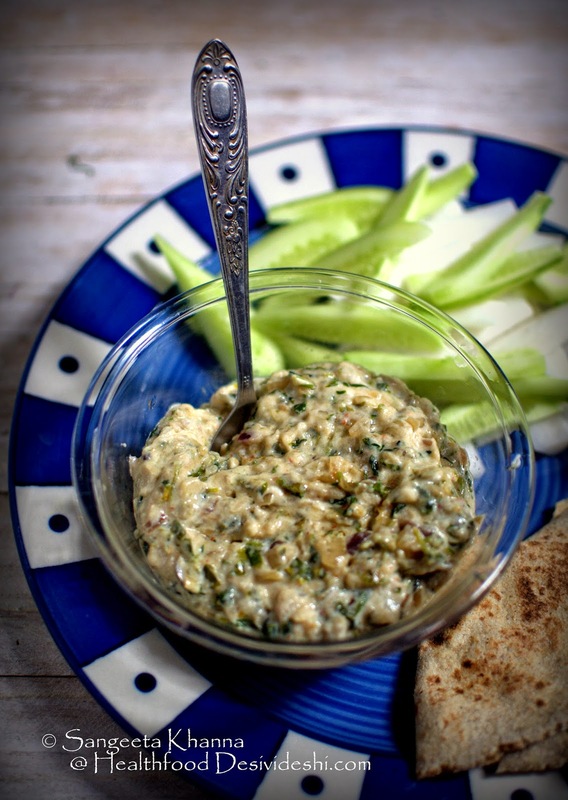 This raita is more like a mashed chunky mix of flavours that feels almost like a subzi (curry). You can make it more like a white raita by adding more yogurt or buttermilk to the recipe but it would depend what you are serving it with. Tweak the recipe as it suits you. Mash everything together to make a thick mix. Serve as required. Here I had it with a multigrain roti (flat bread) and amle ka achar along with loads of cucumber and radish batons on the side. The kind of simple meals I like. 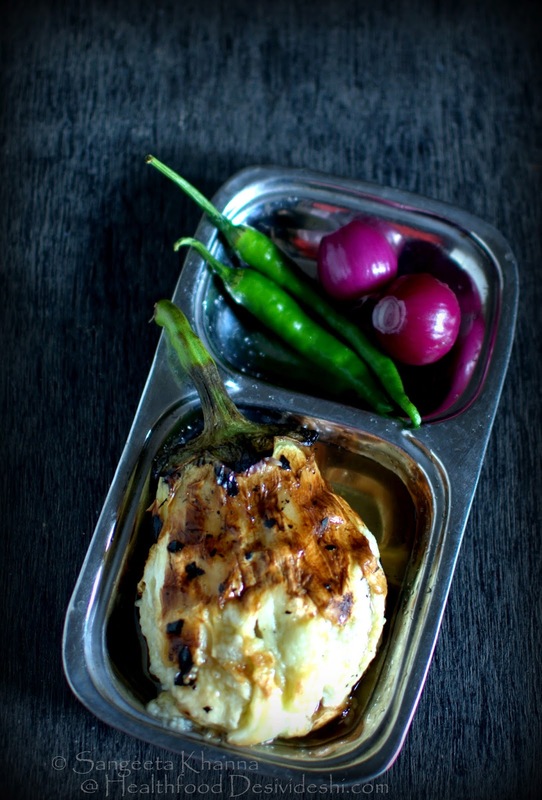 Such meals are very good for days when you want a light yet tasty meal to satiate you. 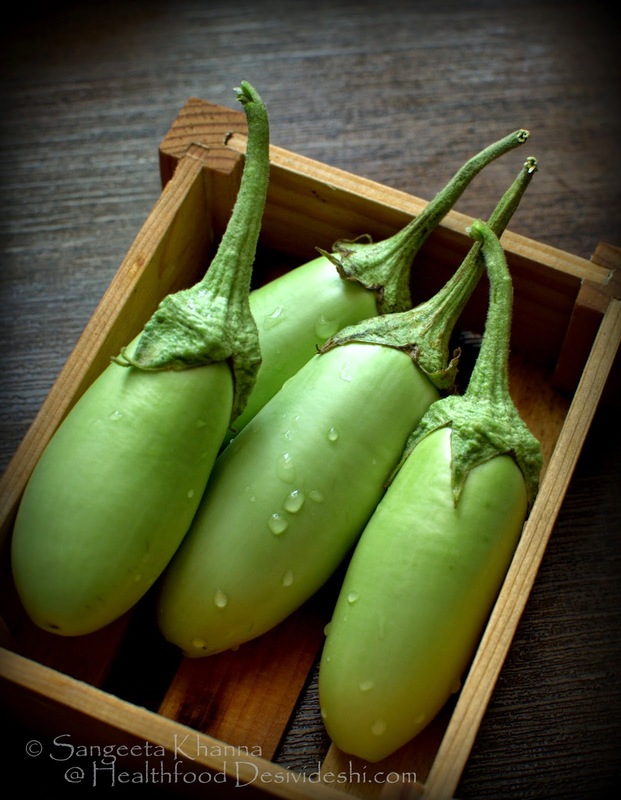 I have shared some oriental style eggplant recipes here, please check out if you love eggplants like me and want to eat eggplants differently.